Place ingredients in blender with several handfuls of ice. Blend until smooth and pour in margarita glasses. Garnish with lime or peach slices. Peaches not your thing? Check out our classic margarita or head over to Sweet Caroline’s who posted margarita with lime zest earlier this week. This entry was posted in Recipes, Spirits and tagged cocktails, lime, margarita, peaches. Bookmark the permalink. That looks great, I’ve been able to get some really good peaches this year! My friend and I were just finding peaches today at the Farmer’s Market and they were so ripe and smelled ready to be transformed into Margaritas. Alas, she is making ice cream with them but wouldn’t this be a good chaser? Perfect. When they get ripe, they get ripe and the race is on. This sounds great though I still haven’t seemed to have gotten my invite to one of these parties ;)! That is the PERFECT way to eat fruit! i am suddenly very thirsty. What a great post! Love the cocktail and I want those margarita glasses! How does anyone stand up in your house – the Cheers bar on the heading is apposite! By the way, thanks for all your support. We have stragecially placed stools all over the house. You’re welcome! It’s only just 9in the morning. I’m walking out a train station. And now I want a cocktail… I blame you. These look amazing. I really need to expand my cocktail making skills! I couldn´t sleep last night with the heat and at about 5.30am this recipe popped up as I was catching up with my messages. I found myself craving a peach margarita and eventually went back to sleep dreaming of icy cold tequila. A bit of a worry eh…and I blame you! I wonder why I have been making peaches with gin for years… Looking at your margaritas I already know I will love them! (And not later than this weekend, or maybe even tonight). Do you have any suggestions for the peach schnapps substitute? Would Cointreau introduce too much of a different taste? Just add extra peach. A bit of orange flavor won’t hurt. What’s not to like about this? :) Yum. 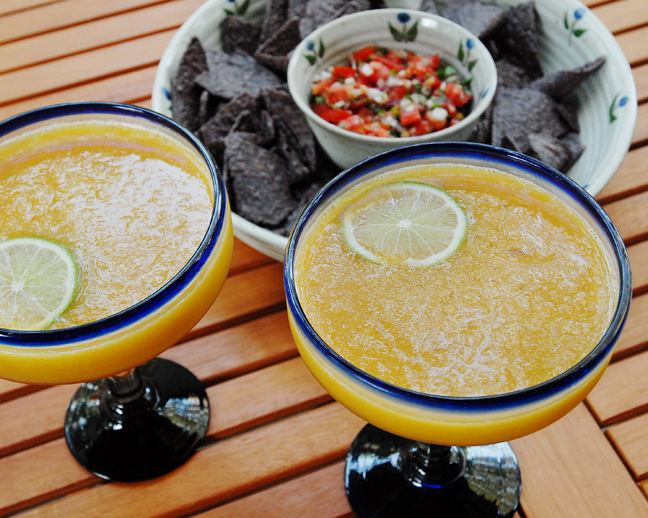 I love margaritas – and I love peaches! What a great idea! Mm, my 3 favourite things smushed up and converted into a drink are peach, raspberry and mango. I would love this by default then 😉 Looks cool, refreshing and delicious! It’s hot in London today and I’m salivating at the sight of them margaritas! Oh why oh why is it so cold here – I NEED summer so I can have a cocktail! Another winner. You had me at margarita, but peach-flavored….omg, heaven! Seriously… now I’m thirsty AND hungry! Well done once again Rufus. I don’t drink tequila. Haven’t in years. This looks great though. Cheers to those who partake. Where do I begin….the photo is stunning with those blue rimmed glasses and teasing of salsa and chips to go with the drink!! And speaking of the drink, well I’ve said many times, peach is my favorite flavor so I’m really loving this recipe!! Pesch Margaritas? This is the most incredible drink I have ever seen!!! Wow!!!!! This is definitely a winner!!! Bravo!!! I’ve done it with mango, but not with peach. Peaches are currently on sale. If this is what it takes to inspire this cocktail, then bring on the heat! That is such a southern way to deal with the heat. Cheers to you! i just had a two frozen peaches today…yummmmy! Mmmm…I am reading this at 5 am. Is it too early for one of those? Great idea and it looks so refreshing! Nope, it’s just really late! Margaritas are my favorite drinks. I don’t think I have ever had a peach one! Must try this. I made Peach Margarita yesterday! It just wouldn’t get out of my head… I have modified it a bit, but it was still fantastic! Thanks once more for this recipe! Great, I always expect people to modify things a bit to their tastes and to fit what they have on hand! OMG! I love this recipe! Margaritas are now on the menu for this weekend. Made this the other day. I don’t like peaches. I don’t like schnapps. I don’t even like Margaritas. This was the most refreshing and tasteful summer drink I have ever had. Even made me forget about the mosquitos. Thank you. Only fall makes me forget about mosquitoes, but I’m so glad you enjoyed it.